Instant Alerts When Your Cron Jobs Fail Silently Monitor 20 Cron Jobs For Free. Affordable Plans if You Need More. Make HTTP requests to the Ping URL at regular intervals. When the URL is not pinged on time, Healthchecks.io will send you an alert. You can monitor any service that can make HTTP requests or send emails. Healthchecks.io monitors the heartbeat messages sent by your cron jobs, services and APIs. Get immediate alerts you when they don't arrive on schedule. A list of your checks, one for each Cron job, daemon or periodically running task you want to monitor. Give names and assign tags to your checks to easily recognize them later. Tap on the integration icons to toggle them on and off. 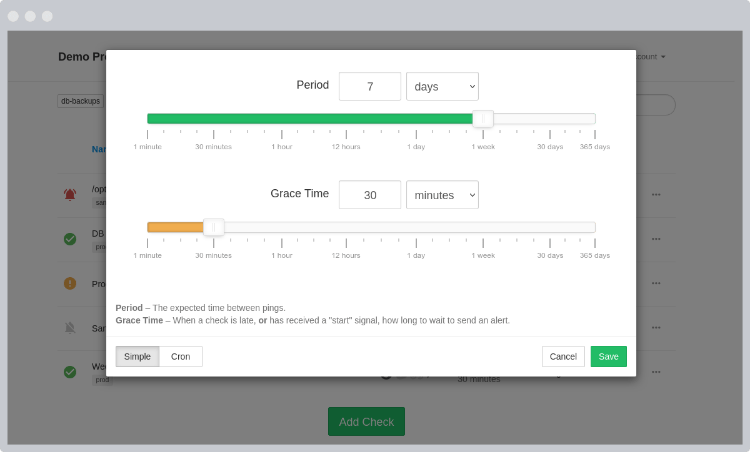 Adjust Period and Grace time to match the periodicity and duration of your tasks. Down. Time since last ping has exceeded Period + Grace. When check goes from "Late" to "Down", Healthchecks.io sends you a notification. 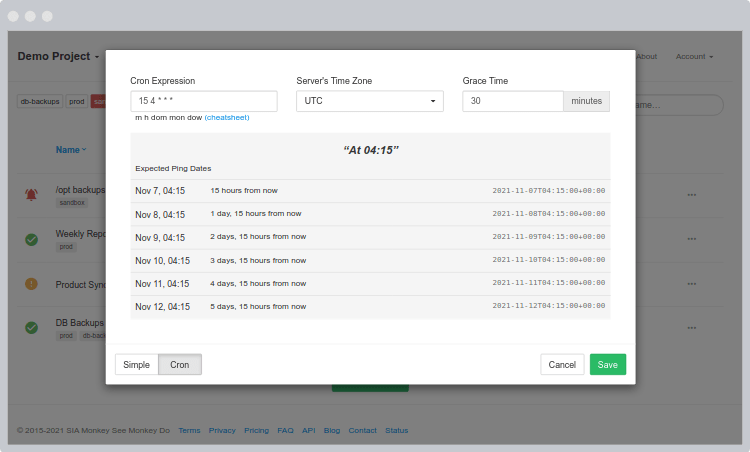 Alternatively, you can define the expected ping dates and times using a cron expression. See Cron Syntax Cheatsheet for the supported syntax features. Grace Time specifies how "late" a ping can be before you will be alerted. Set it to be a little above the expected duration of your cron job. You can add a longer, free-form description to each check. 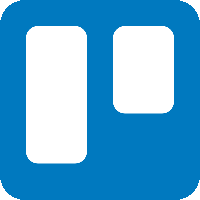 Leave notes and pointers for yourself and for your team. You can also see the log of received pings and sent "Down" notifications. 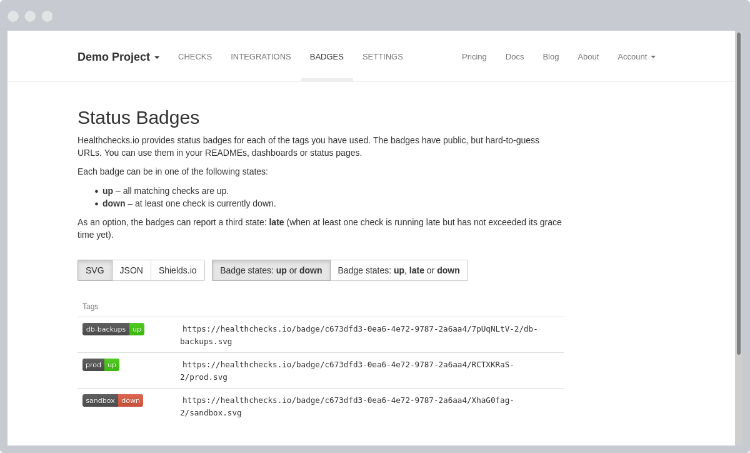 Healthchecks.io provides status badges for each of the tags you have used. Additionally, the "Healthchecks.io" badge shows the overall status of all checks in your account. The badges have public, but hard-to-guess URLs. You can use them in your READMEs, dashboards or status pages. What Can I Monitor With Healthchecks.io? Healthchecks.io monitoring is a great fit for cron jobs and cron-like systems (systemd timers, Jenkins build jobs, Windows Scheduled Tasks, wp-cron, uwsgi cron-like interface, Heroku Scheduler, ...). A failed cron job often has no immediate visible consequences, and can go unnoticed for a long time. 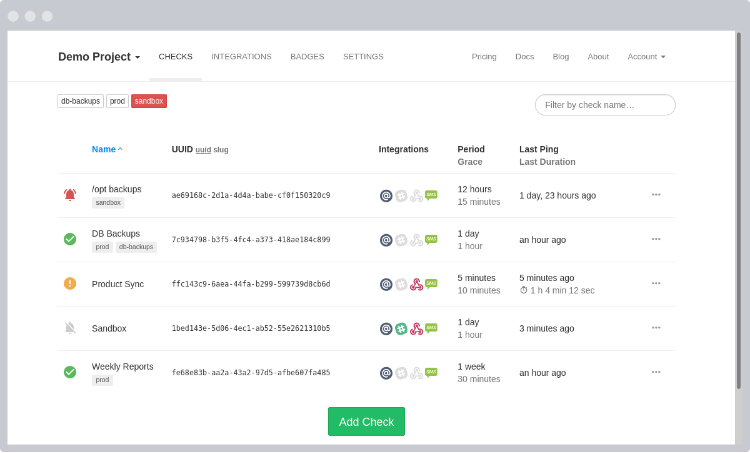 Healthchecks.io monitoring can be used for lightweight server monitoring: ensuring a particular system service, or the server as a whole is alive and healthy. Write a shell script that checks for a specific condition, and pings Healthchecks.io if successful. Run the shell script regularly. Healthchecks.io is a free and open source service. 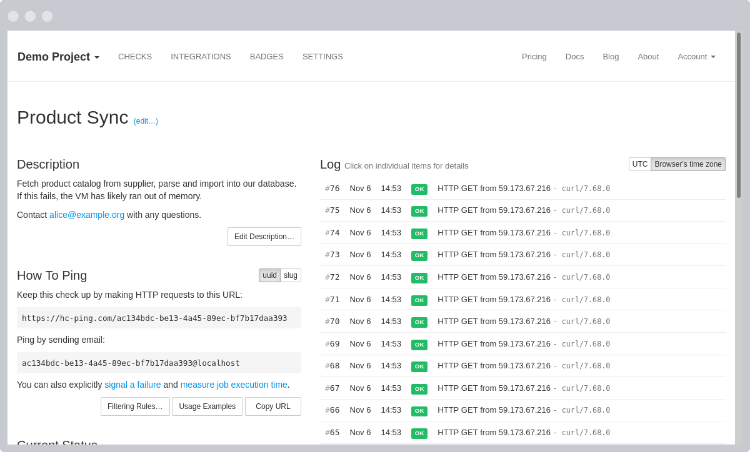 Setting up monitoring for your cron jobs only takes minutes. Start sleeping better at nights!